Hello Mars -- This is the Earth! Yesterday, we looked at Wernher von Braun's 1954 vision for a manned mission to Mars. But long before people imagined how we might plausibly put boots on Martian soil, we dreamed how one day we might be able to communicate with the planet. Thanks to "canals" spotted on Mars in the late 19th century, there were some people here on Earth who thought there were indeed intelligent Martians somewhere out there. American astronomer Percivall Lowell, who wrote Mars as the Abode of Life in 1908, argued that what looked like canals on Mars were constructed by intelligent beings to bring water from the frozen poles to the dry equator. Lowell's "canals" were first written about in 1877 by Italian astronomer Giovanni Schiaparelli, who actually interpreted these passages as "channels," or natural occurring formations that need not have been built by intelligent life to exist. If there are indeed Martians out there, and no conceivable way to journey there ourselves, how might we communicate with them? 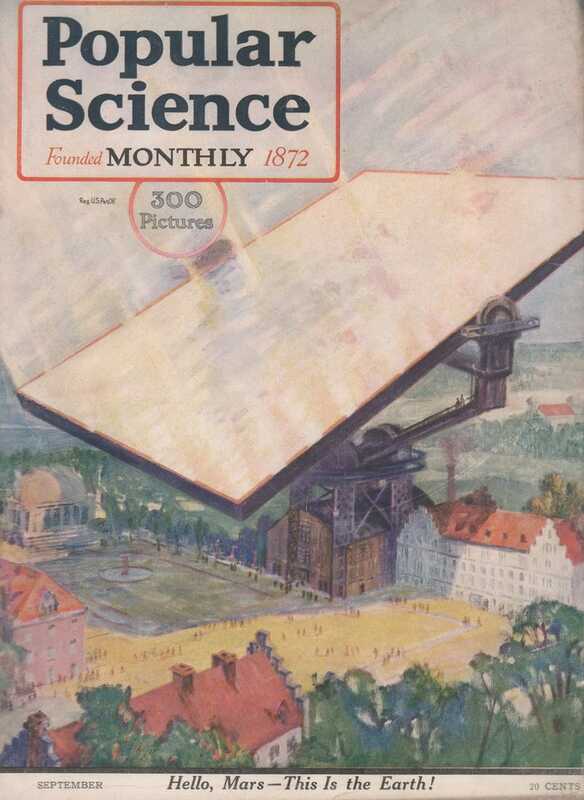 The September 1919 issue of Popular Science Monthly featured a cover with a gigantic mirror mounted so that it could swing on an axis and reflect the sun's rays up to Mars. The magazine imagined that Earthlings' best bet would be to communicate with the planet in 1924, the next time when Mars would be closest to Earth. The more imaginative modern astronomers are inclined to believe, with the late Professor Percival Lowell, that Mars is inhabited. Assume that Mars is inhabited. How can we talk to the Martians? What a world-wide sensation there would be if we were to receive from Mars a flash in response to a signal of ours! In 1919, legendary animator Max Fleischer produced a short film called Hello Mars which was released in 1920. Unfortunately, I haven't been able to find a copy of it — and it's entirely possible that one no longer exists — but if you know where to find a copy please let me know in the comments. The film, as Popular Science explains, sets about explaining the way in which humans might communicate with Mars in 1924 via mirrors (as seen on the cover of the magazine), huge flashing electric lights (thought to be too costly for the time) or gigantic strips of black cloth set out in the desert. But how will the scientists signal Mars? At its nearest, the planet will be about thirty-five million miles away in 1924. Various proposals have been made by Professor Pickering, Professor Wood, and the imaginative Professor Flammarion. In order to visualize and explain how these distinguished astronomers will communicate with Mars, Mr. Max Fleischer has directed the preparation of a motion-picture film for the Bray Studios. Through the courtesy of Mr. Fleischer and the Bray Studios we are enabled to present on these two pages excerpts from the film. The first (and most expensive) method of contacting Mars that's explained in the film/magazine shows how millions of electric lights could be placed somewhere on Earth so that it might be visible from space. The well known French astronomer, Professor Camille Flammarion, who has done more than any other man in Europe to popularize the notion of Mars' habitability, suggested that an enormous area on the Earth should be covered with electric lights. It would be a costly experiment. A huge tract of land — a considerable portion of the Desert of Sahara, for instance — would have to be "planted" with millions of lamps. The current to illuminate the lamps would have to be generated in a power house big enough to run a railway. Andrew Carnegie once said that he hated to die rich. Here is a chance to get rid of several million dollars at one swoop. The illustration above explains how a strips of cloth attached to electric motors may be set out in the desert in order to "wink" at the red planet. The picture at left looks like a neatly cut-up farm. It represents Professor R. W. Wood's proposed method of communicating with Mars. The Professor would cover some huge white space on the earth, a portion of the Desert of Sahara, for instance, with strips of black cloth. These strips he would wind and unwind by means of electric motors. The result would be a series of winks. When the black strips are wound up, the white sand below reflects the sun's rays; when the strips are unrolled, the white area is covered. This is probably the cheapest method of optical signaling yet proposed. Since this article was published in 1919, it's important to remember that the world was still reeling from the devastation of WWI. The magazine imagines that not only would we have much to tell Martians, but we would likely have much to learn. To the right we have the earth flashing a message to Mars. Who knows but some day we may tell the Martians all about our great war, all about the struggle for democratic ideals, all about the terrible upheaval through which we have just passed! Perhaps we will learn from an older and wiser planet how we ought to run the Earth.